Frequently on floodplains, overgrazed pastures. Most frequent on calcareous soils. Claytonia virginica, Cornus racemosa, Eupatorium rugosum, Fraxinus americana, Geum canadense, Osmorhiza claytonii, Prunus serotina, Ribes missouriense, Sambucus canadensis, Sanicula gregaria, Ulmus americana, Viola sororia, Vitis riparia. New England and southeast Canada south to AL, west to MN, KS, and OK.
Wide-spreading tree to 12 m; branches with 2" long, curved thorns; older bark rough and scaly. Leaves simple, broadly rounded, downy pubescent beneath particularly when young. 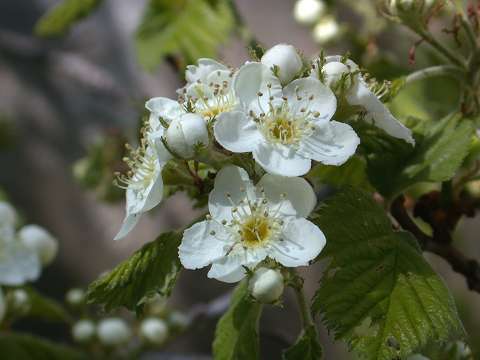 Flowers white, in round corymbs; petals 5, stamens 20; styles 4-5; sepals finely divided. Fruit a red drupe that ripens in early fall, does not persist into winter. Not very popular for landscaping but can be an attractive tree. Fall colors range from yellow to brown. Leaves tend to get spotty in the summer from rust.